The iPhone 5, both in the black and white models, features aluminum surfaces on the sides and along most of the back. Aluminum is silver in color. The black iPhone 5 has been anodized, which is a chemical process which changes the color of the metal from silver to black. Many iPhone 5 owners have reported cosmetic defects on their devices while they are brand new. The phones have small scuffs, chips, or scratches along the edges. These typically appear along the sharp edge at the front or back of the phone. 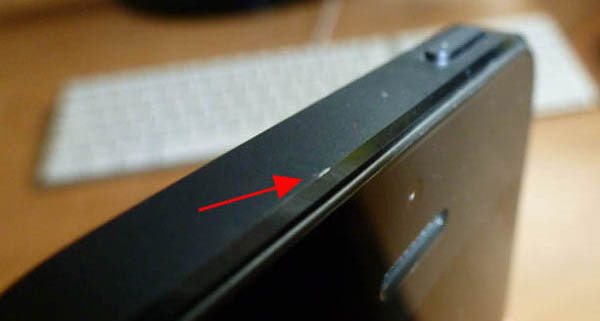 On the black iPhone 5 model, the scuffs are more noticeable as they cause silver specks to appear on an otherwise black edge. On the white model, the side and back of the phone are silver in color. When the anodized finish is missing on white models, the spots appear as a more reflective, lighter silver color which stands out less. Some have chosen to exchange their iPhones as their finish is less than perfect out of the box. Our best recommendation is to inspect your new phone immediately after removing it from the box. Check all edges of the phone for silver specks of missing finish. If you are unsatisfied with the phone, consider exchanging it at the place of purchase. If you ordered online, go to a retail store for Apple, Verizon, AT&T, Sprint, or whichever vendor you purchased from. If you have a new phone in acceptable condition, we strongly recommend purchasing and using a protective case or full-body adhesive protector as soon as possible. This will ensure that the edges of the phone are protected from the bumps and scrapes which may cause the black finish on your phone to wear off. If scratches later appear due to normal use, read our article on repairing scuffs for more details.